Residential or Commercial - Roof Area up to 25 squares. 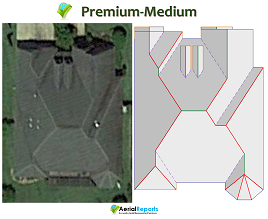 Premium - Small Report costs $30 for structures with roof area up to 25 squares for a single structure and does not include any detached structure. For roof areas greater than 25 squares, extra $10 for every additional 25 squares will be charged. (for E.g. a structure with roof area of up to 50 squares will cost $40.00 and for roof area of up to 75 squares will cost $50.00 and so on). For structures with roof area greater than 200 squares, please send us a text message on 508-321-9100 and we will call you to discuss the pricing. *Unsure of the property size? Don't sweat it! We'll charge the balance amount to the original form of payment in case the roof area is greater than 25 squares. Residential or Commercial - Roof Area up to 50 squares. *Unsure of the property size? Don't sweat it! We'll charge the balance amount to the original form of payment in case the roof area is greater than 50 squares. Residential or Commercial - Roof Area up to 75 squares. Premium - Large Report costs $50 for structures with roof area up to 75 squares for a single structure or including a detached structure of up to 20 squares. For combined roof areas greater than 75 squares, extra $10 for every additional 25 squares will be charged. (for E.g. a structure with roof area of up to 100 squares will cost $60.00 and for roof area of up to 125 squares will cost $70.00 and Price caps at $80.00 for up to 200 Squares ). For structures with roof area greater than 200 squares, please send us an eamil or a text message at 508-321-9100 and we will call you to discuss pricing. *Unsure of the property size? Don't sweat it! We'll charge the balance amount to the original form of payment in case the roof area is greater than 75 squares. Quickest and most Economical Solution for Estimating Roofing projects based on roof's Square Footage. This professional, concise report includes a waste factor calculation table and provides an option to customize the cover with your logo and contact information turning it into a powerful sales presentation tool. AerialReports.com is a leading provider of offsite aerial measurement services. We are pleased to announce the launch of Pavement Measurement Reports. 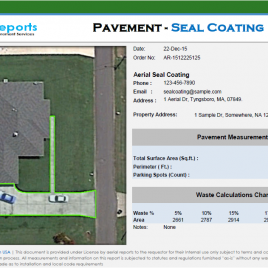 Leveraging the industry's proven and most advanced aerial measurement technology, AerialReports.com provides an accurate and affordable Pavement measurement reports that save the contractors a tremendous time, effort and money. AerialReports.com is a leading provider of offsite aerial measurement services. We are pleased to announce the launch of Gutter System Measurement Reports. Leveraging the industry's proven and most advanced aerial measurement technology, AerialReports.com provides an accurate and affordable gutter system measurement reports that save the contractors a tremendous time, effort and money. www.aerialreports.com © 2014-2017 All Rights Reserved. Northway Management & Consulting LLC.